This Latin American dish is the perfect accompaniment to a buffet or to enjoy with friends. Marinating, then slow cooking the beef makes it meltingly tender for shredding. Traditionally flank steak is used, but silverside works well in this recipe. 24 hours before, slash the beef on both sides. Mix the spices and 1 tbsp olive oil in a small bowl. Pour over the beef and rub well into the meat. Cover and refrigerate overnight. Heat a suitable sized frying pan until hot. Add 1 tbsp oil and sear the beef on all sides until browned. Place into a removable slow cooker bowl, pour over the ale, cover and cook on high for 4-5 hours, until tender. Prepare the guacamole. Mash the avocados and add the remaining ingredients, mix well and chill until required. Heat your oven to 200°C/400°F/gas mark 6. Remove the beef from the slow cooker, place onto a plate and using 2 forks, gently fork and shred the meat. Using a medium sized baking tray, place half of the tortilla chips to cover the tray and add half of the beef (dispersing this evenly), then sprinkle with the chopped jalapeños and half of the grated cheese. Repeat the layer again, using up all of the ingredients. Place into a hot oven for 5 minutes until the cheese has melted. 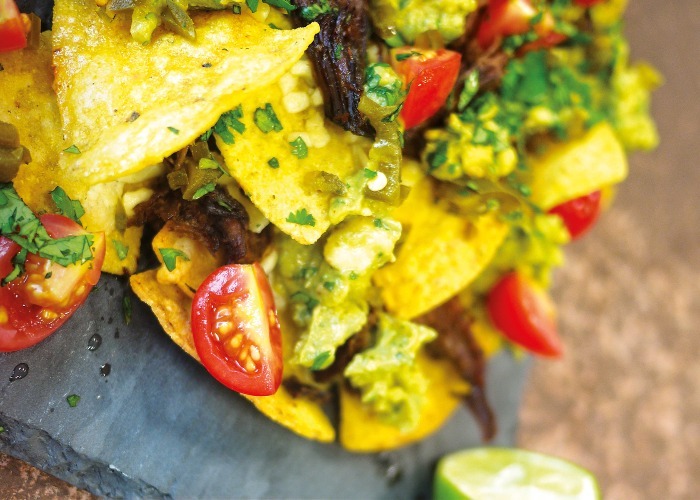 Place spoonfuls of the guacamole over the hot nachos, sprinkle over the tomatoes and coriander. Serve immediately, best eaten with fingers.